Concentrated 1% retinol effectively improves the appearance of wrinkles and skin tone. A booster to up the anti against ageing. 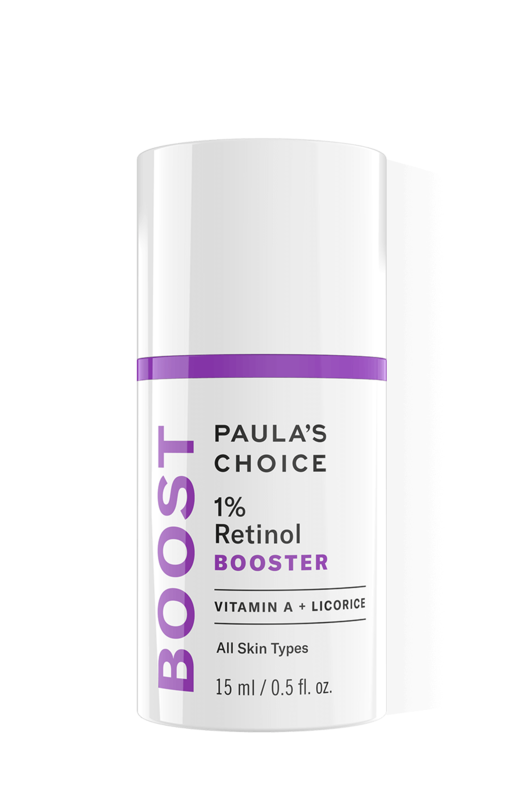 This concentrated 1% Retinol Booster works to effectively improve the appearance of wrinkles, reduce pore size and improve skin tone. The light-weight, fluid booster combines retinol with antioxidants and peptides for a clearer, more radiant and younger-looking complexion. Apply once or twice daily after cleansing, toning and exfoliating. Dispense 2–3 drops and add to your favourite moisturiser or serum. May also be used alone. For daytime, follow with a broad-spectrum sunscreen rated SPF 30 or greater. May be applied around the under-eye area. I bought this item because I have small areas of pitted skin on my forehead and jaw area, due to blemishes. While they cover up quite well with foundation, I still feel conscience by it. I am really glad I bought this though as I have noticed a difference, after about 10 uses. I use it about 3-4 times a week and it feels silky and nice when applied. I have noticed a difference as my pitted skin is now reducing and I feel more confident. I just wish the product was a little bigger, maybe a 30ml or 50ml, for the same price. I absolutely love this product, it makes a huge difference to my skin, fine lines are gone, and texture and pores are so much better. I use it in the morning with the vitamin c serum, before moisturiser. I wish there was a way to tell when it is running out, and it is very expensive, hence the 4 star. I’ve been using this product now for about 6 months. It’s been excellent at improving the texture of my skin and minimising the appearance of pores. It gave me and immediate brightening effect which has been long lasting. I use 2 or 3 nights a week and that’s enough to give me excellent results. The best retinol product I’ve come across. I am loving this retinol booster so far, it's nearly finish and going to my 2nd new bottle, it made my skin smooth and brighter. Only downside is not alot in the bottle only 15 ml, so far i've used this for just over a month every night but worth it though in my opinion. I have used up all of mine (and it would have been nice to know i was running out, but product stability is the most important thing i know). I often used it neat and it gave me good skin days quite often, I also did love mixing it with moisturisers as well. I've used prescription retinol so my skin had no issues handling this stuff and it didn't make me peel at all. I love the fact that you can add this to anything which means you can make your favourite serum/moisturiser into a more effective version of itself and I would repurchase if I wasn't busy testing out the other clinical retinol product that PC does. The formula is yellow and runny and there is no fragrance to it - it mixes well and sinks in quick (depending on what you mix it with). Highly recommend this if you want retinol in your life (which you should). Binky Bowles-Balls - Holy Grail! Had this in my latest order. 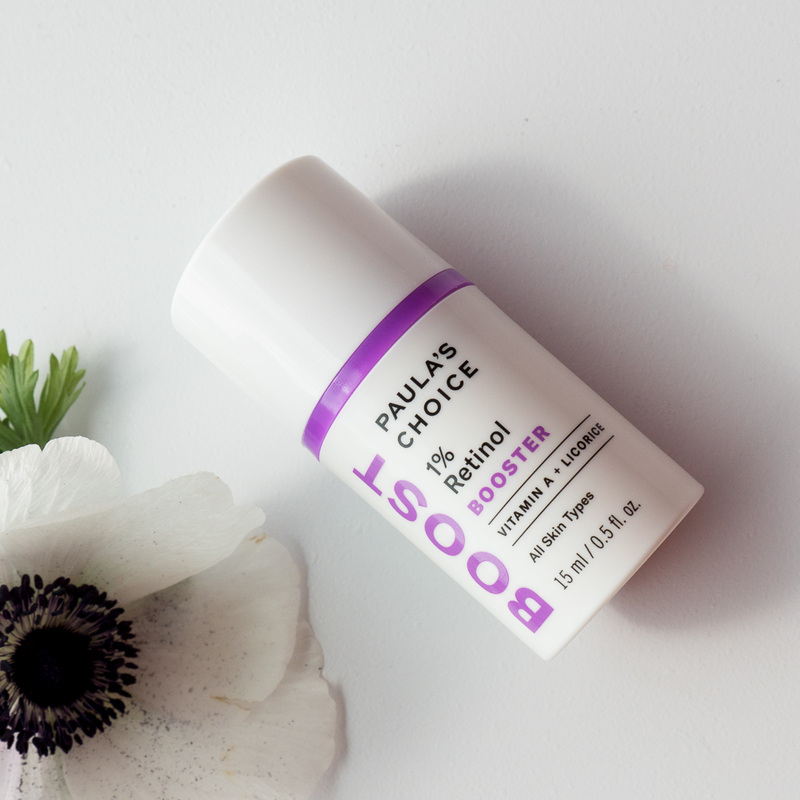 It's an absolutely beautiful product, light as water, non-greasy too and utterly brilliant as it can be added to almost any other Paula's Choice product for extra 'oomph'. Totally lightweight and gorgeously non-irritating. I reckon 150-200 pumps in this bottle, so completely worth the price on a 'cost per wear' basis. Contains antioxidant and skin-soothing properties. Aqua, Glycereth-7 Triacetate (emollient/texture-enhancing), Glycerin (hydration/skin replenishing), Carthamus Tinctorius (Safflower) Oleosomes (emollient/skin-soothing), Isopentyldiol (hydration), Polyglyceryl-10 Behenate/Eicosadioate (texture-enhancing), Butylene Glycol (hydration), Pyrus Malus (Apple) Fruit Extract (antioxidant), Polysorbate 20 (texture-enhancing), Retinol (skin-restoring), Polyglyceryl-10 Laurate (texture-enhancing), Glycyrrhiza Glabra (Licorice) Root Extract (skin-soothing), Avena Sativa (Oat) Kernel Extract (skin-soothing), Ceramide NP (hydration/skin replenishing), Palmitoyl Tripeptide-1 (skin-restoring), Dipotassium Glycyrrhizate (skin-soothing), Allantoin (skin-soothing), Epilobium Angustifolium (Willow Herb) Flower/Leaf/Stem Extract (skin-soothing), xilaS Alba (Willow) Bark Extract (skin-soothing), Arctium Lappa (Burdock) Root Extract (skin-soothing), Hydrogenated Lecithin (skin-restoring), Caprylyl Glycol (emollient), Dipentaerythrityl Tri-Polyhydroxystearate (texture-enhancing/emollient), Bis-Glyceryl Ascorbate (antioxidant), Ethylhexyl Methoxycrylene (texture-enhancing), Disodium EDTA (stabilizer), Xanthan Gum (texture-enhancing), Phenoxyethanol (preservative), Sorbic Acid (preservative). What is the difference between the 1% Retinol Booster and the Clinical 1% Retinol Treatment? To start, there are similarities between the 1% Retinol Booster and Clinical 1% Retinol Treatment. Both contain a high-level of 1% retinol, and each is formulated with peptides and a significant amount of antioxidants and anti-irritants. Where they really differ is in terms of texture, usage, and which skin types they are ideal for (although both products are suitable for all skin types). The 1% Retinol Booster has a fluid texture that allows it to be mixed in with your favourite serum or moisturiser. Its formula is thinner, lighter, and especially well-suited for normal to oily or breakout prone-skin. It’s also a phenomenal option for ANYONE who wants to boost their current skincare routine with a higher strength of retinol. Adding 1% Retinol Booster to your serum or moisturiser allows it to work more gently on your skin, so you can use it more frequently – even as a daily part of our routine. The Clinical 1% Retinol Treatment has a creamy lotion texture that is most ideal for normal to dry skin. It’s an intensive high-percentage retinol treatment that a consistent retinol user looking for powerful results will love. It’s best to slowly add this to your routine – no more than a pea-sized amount up to 3 times per week to start – and adjust based on your individual experience. Yes, though you may wish to alternate them—this will depend on how your skin responds. You can also apply your usual retinol product (serum or moisturiser) all over your face and neck, then apply 1% Retinol Booster to areas showing more advanced signs of ageing: Crow’s feet around the eyes, laugh lines, expression lines, and dark spots.